How does transform handle aura's and enchant creature's? At the beginning of each upkeep, if no spells were cast last turn, transform Reckless Waif. Reckless Waif Flip has always been part of the “maybe list” for this deck. I really like her, but in practice she was usually “dead meat”. She would die so easily that sometimes she was not even worth the trouble. In comparison Village Messenger Flip had haste and evasion once transformed, this replacing her for good. Now with the inclusion of Rhythm of the Wild , she is way more appealing, and she has been moved to the side board. This lets me “transform” the deck into a way more aggro deck if needed, replacing some 3 or 4 mana drops. 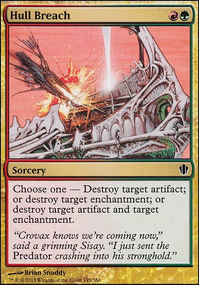 Again, on Moonmist , great card, but not as good as a remove spell on the spot, or that burn spell that gets the last couple of life points off your opponent. However I have found it to be an amazing sideboard option. I have been testing Wolfbitten Captive Flip extensively. So far the results are a mixed bag, but I am definitely considering to add him as a main deck or at least as a side deck option. 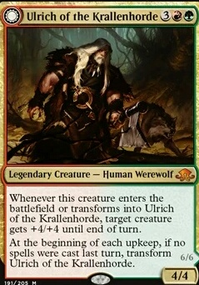 whoever said that onedrop werewolves are useless, i think a turn 1 Village Messenger Flip or Reckless Waif Flip is just fine, build up some pressure, speed up your gameplan, AND you're playing 12 lord effects. so why not? 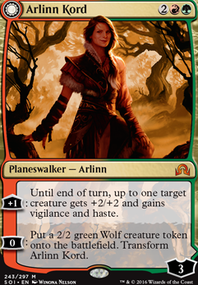 Aether Vial gives you the option to put creatures into play without casting any spells, thus your wolves will flip if nobody else plays a spell. Reckless Waif Flip just doesn't fit the gameplan of the deck. We're not trying to aggro our opponent out, which a 1 mana 3/2 is good at doing, we're trying to blood moon our opponent on turn 2, which the 1 mana 3/2 is bad at doing. 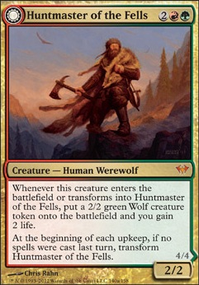 A flip card that could work is something like Huntmaster of the Fells Flip, which gives value when it enters. I've fiddled around with werewolves in the past, since I love interesting, unusual mechanics. I never was quite satisfied with it--I dislike playing aggro to begin with, and they just are a subpar creature type. 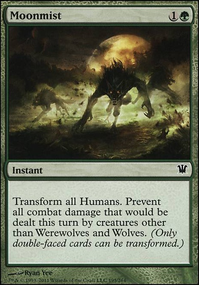 Moonmist and Immerwolf are auto-includes in any werewolf deck--you cannot afford to transform your werewolves by wasting a turn not counting spells, and an opponent hitting their second spell to transform your wolves is far too easy in the mid to late game. Otherwise, I would focus on low converted mana cost werewolves. As with any aggro deck, your goal should be to flood the board as quickly as possible. Mayor of Avabruck Flip, Reckless Waif Flip, Village Messenger Flip, Wolfbitten Captive Flip, and Kruin Outlaw Flip are all solid options. Your curve should top out at 4, with the bulk of your creatures in the 1-2 mana range. Your little creatures can quickly become big, game-winning ones, so you do not need to have expensive-to-cast bombs. what happened to Reckless Waif Flip and still other White Aether vial decks are still too fast for this. Vial decks are finite.